Woodbine shipper Florida Won, coming off a victory in a Grade 3 stakes at his home track, delivered as the 2-1 favorite in Sunday’s $200,000 Presque Isle Mile. 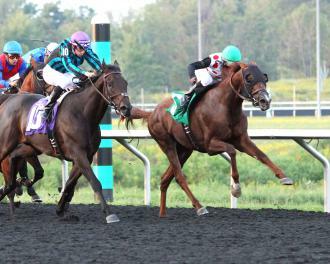 Florida Won (5) launches his winning rally under Patrick Husbands in the Presque Isle Mile. Jockey Patrick Husbands, who sat patiently in seventh through the first six furlongs, found an opening along the rail and the 4-year-old Florida Won ($6.60) responded in deep stretch to win by three-quarters of a length over 5-2 second choice Midnight Cello. Decisive Moment, the early pacesetter through fractions of 47.64 seconds and 1:12.01, finished third by a neck. Are You Kidding Me, a two-time Grade 2 winner in Canada this summer, got fourth at 3-1 by a nose over Ghost Hunter, whose rally was blunted when he got bumped by a tiring Abraham in the stretch. The winning time was 1:36.64. Catherine Sullivan, an assistant to winning trainer Mark Casse, said she had some concerns when Florida Won was far back and in traffic. Florida Won is now 4 for 11 lifetime with earnings of $361,903. In four starts on synthetic surfaces, he has three wins, including the Grade 3 Ontario Derby and the Grade 3 Seagram Cup, and one second.